Although the “Flow” workshop below is complete in itself, it also serves as a basis for the “Dynamics” and “Writing” workshops which follow. This workshop introduces a vital, new approach to calligraphy focusing upon flow — the life spirit of form. To cultivate letterforms with flow requires increasing our awareness of, and sensitivity to, touch and rhythmical movement. To nurture this growth I offer exercises in “dynamics” technique: a way to develop the interplay of body, tool and writing surface. Just as this training and sensitizing provides a natural foundation for learning calligraphic letterform, it also serves as a basis for exploring alphabets as gestural line and artistic self-expression. Moreover, the body-mind work of this holistic, interactive approach offers many ‘objects’ for the practice of calligraphy as meditation or mindfulness training. While the aim of this workshop is to help expand awareness of flow, its heart lies in a process of dicovery and development. As we attune body, mind and senses through it, we bring greater confidence and joy to calligraphic practice! An example of the graphic explorations which can emerge, spontaneously, from “flow” work! “Navigating” that led to experiments with letterform! The basis of vital letterform is vital strokes! Engaging “Dynamics” technique as a foundation for such calligraphic vitality, we will now apply its methods to the strokes and letterforms of calligraphic alphabets. Although “Dynamics” technique is applicable to any edged-pen alphabet, it is helpful to choose a particular one, for example Italic, by which to explore and develop it in relation to stroke — letterform. Pen in hand, through developmental exercises, activate all your calligraphic senses — touch and movement in addition to sight — and discover a path to sensitive, skillful, confident strokes. In the process of translating visual forms into fully perceived ones, rhythm and gesture emerge and we experience the dance of the pen! Your workshop was the most energizing calligraphy class I have ever attended! Usually I feel drained after an intense two days of study but your workshop was full of discovery and absorption. I am already planning my studio play sessions. I always warm up before working, but now my warm-up will include exercise and pen-play, and I know the letterform practice will be well connected not only to my mind, but also to my whole being. Thank you! With a calligraphic foundation in flow and dynamics we are now prepared to enact writing — letter, word and line — as rhythmical, felt movement. This workshop offers a method for developing calligraphic rhythm which also invites and cultivates feeling. The full spectrum of contemporary calligraphy, from scribal to interpretive to experimental, comes to life only as we infuse it with these qualities. 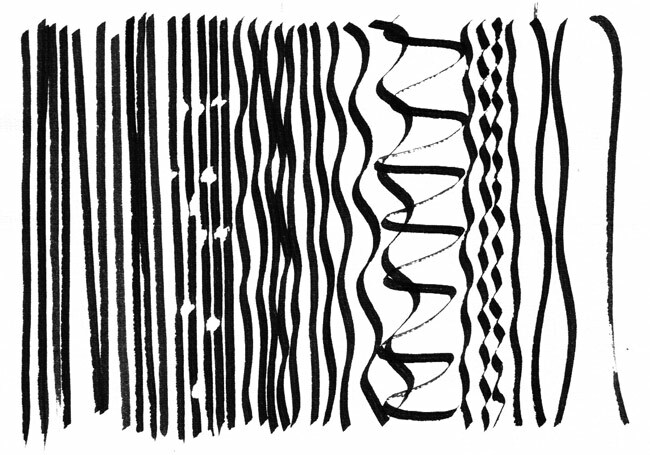 In current calligraphic education we already learn to understand an alphabet’s visual motifs as letter ‘families’; we can now experience them as fluid patterns of rhythmical movement. As the body awakens and becomes familiar with these movements, they gradually become enacted as gesture. In addition, exercises in rhythm and gesture train our awareness to include continuity of movement: the pen in motion both on and off the writing surface. Come and discover the expressive range of the Roman alphabet — from formal to cursive flow — across its palette of styles and within many of them as well! ©2007-2018 Gina Jonas. All rights reserved.